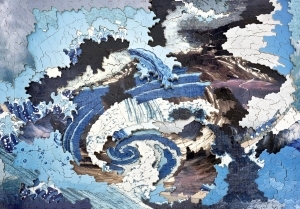 The Waves is made of seven layers of jigsaw puzzles. It’s a collage that combines different images of waves or swirls in a single representation. The missing pieces reveal the lower layers. Delieutraz Caroline was born in 1982, she lives and works in Paris. At age two, she plays the baby in a horror movie. She holds a postgraduate of the École Nationale Supérieure des Arts Décoratifs in Paris and a Master’s Degree in Fine Arts from the University Paris 8. Her work was recently shown in France and abroad during group exhibitions in Microwave Festival in Hong Kong (Living Architecture), at Carroll / Fletcher Gallery in London (Unoriginal Genius), at La Maison populaire de Montreuil (Re-emergences ) and at the Biennale of Belleville in Paris. In 2016, she presents a solo exhibition at the gallery LocaleDue in Bologna (Doppia Visione). She’s currently preparing a solo exhibition to be held at gallery 22,48m² in Paris.